Collect mail for two separate homes elegantly using this Whitehall Bronze Dual Personalized Mailboxes Package. This wonderful combination of a post, two mailboxes, and a support bar lends curb appeal to your home in moments. The 74" tall, bronze colored post slides over a wooden 4 x 4 post (not included), for easily supporting the 23.75" long, horizontal beam and both mailboxes. These generous receptacles, approved by the U.S. Postmaster General, are 20% larger than traditional mailboxes, accommodating magazines, catalogs, or small packages with ease. The bronze color of each aluminum piece adds a timeless hint to your area, and each front panel may be personalized with up to five 1.75" tall characters. The gold hue of the customization contrasts the bronze background, and a matching flag on each box completes the station. Its aluminum construction lasts for many seasons, while the powder coated finish protects the units from elemental exposure. 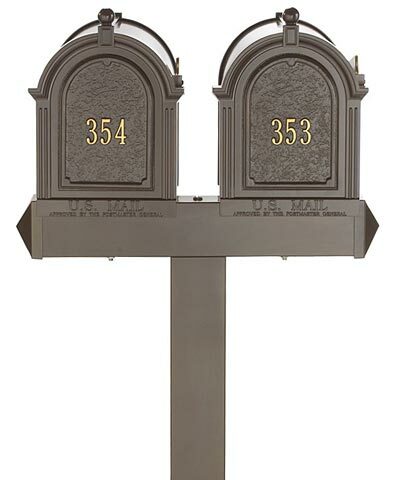 You and your neighbor will certainly receive mail in style using this Bronze Dual Personalized Mailboxes Package. Assembly required.